The Army National Guard (ARNG), in conjunction with the Air National Guard, is a militia force and a federal military reserve force of the United States. They are simultaneously part of two different organizations, the Army National Guard of the several states, territories and the District of Columbia (also referred to as the Militia of the United States), and the Army National Guard of the United States, part of the United States National Guard. 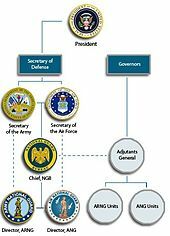 The Army National Guard is divided into subordinate units stationed in each of the 50 states, three territories, and the District of Columbia, and operates under their respective governors. 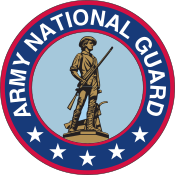 The foundation for what became the Army National Guard occurred in the city of Salem, Massachusetts in 1692, the first time that a regiment of militia drilled for the common defense of a multi-community area. The Army National Guard as currently authorized and organized operates under Title 10 of the United States Code when under federal control, and Title 32 of the United States Code and applicable state laws when under state control. The Army National Guard may be called up for active duty by the state or territorial governors to help respond to domestic emergencies and disasters, such as those caused by hurricanes, floods, and earthquakes, as well as civil disorder. The District of Columbia Army National Guard is a federal militia, controlled by the President of the United States with authority delegated to the Secretary of Defense, and through him to the Secretary of the Army. The President may also call up members and units of the Army National Guard, in its status as the militia of the several states, to repel invasion, suppress rebellion, or enforce federal laws. The Army National Guard of the United States is one of two organizations administered by the National Guard Bureau, the other being the Air National Guard of the United States. The Director of the Army National Guard is the head of the organization, and reports to the Chief of the National Guard Bureau. Because the Army National Guard is both the militia of the several states and a federal reserve component of the Army, neither the Chief of the National Guard Bureau nor the Director of the Army National Guard "commands" it. This function is performed in each state or territory by the State Adjutant General, and in the District of Columbia by the Commanding General of the District of Columbia National Guard when a unit is in its militia status. The Chief of the National Guard Bureau and the Director of the Army National Guard serve as the channel of communications between the Department of the Army and the Army National Guard in each state and territory, and administer federal programs, policies, and resources for the National Guard. The Army National Guard's portion of the president's proposed federal budget for Fiscal Year 2018 is approximately $16.2 billion to support an end strength of 343,000, including appropriations for personnel pay and allowance, facilities maintenance, construction, equipment maintenance and other activities. Of the 45 individuals to serve as President of the United States as of 2017, 33 had military experience. Of those 33, 21 served in the militia or Army National Guard. John Tyler, commanded a company called the Charles City Rifles, part of Virginia's 52nd Regiment, in the War of 1812. Millard Fillmore, served as inspector of New York's 47th Brigade with the rank of major. Commanded the Union Continentals, a militia unit raised to perform local service in Buffalo, New York, during the American Civil War. Franklin Pierce, appointed aide de camp to Governor Samuel Dinsmoor in 1831. He remained in the militia until 1847 and attained the rank of colonel before becoming a brigadier general in the Army during the Mexican–American War. James Buchanan, a member of the Pennsylvania Militia. His dragoon unit took part in the defense of Baltimore, Maryland, during the War of 1812. Rutherford B. Hayes, joined a militia company in 1846 intending to fight in the Mexican–American War, but resigned because of ill health. Enlisted as a private in a Cincinnati militia company at the start of the Civil War in 1861, and was elected commander with the rank of captain. He was subsequently appointed a major in the 23rd Ohio Infantry, and ended the war as a brigade commander and brevet Major General. Chester A. Arthur, became a member of the New York Militia soon after becoming a lawyer. During the Civil War he served on the staff of Governor Edwin D. Morgan as Quartermaster General with the rank of brigadier general. He later served as Morgan's inspector general, responsible for visiting New York's front line units, assessing conditions and recommending improvements. Theodore Roosevelt, commissioned as a second lieutenant in the 8th New York Infantry Regiment in 1884, he served until 1888 and attained the rank of captain. During the Spanish–American War he was commissioned lieutenant colonel of the 1st United States Volunteer Cavalry, which he later commanded as a colonel. In 2001 a review of his war record led to a posthumous award of the Medal of Honor. National Guard Bureau organizational chart depicting command and reporting relationships. Upon the creation of the United States Air Force in 1947, which included the Air National Guard, the National Guard Bureau was organized into two divisions, Army and Air, each headed by a major general who reported to the Chief of the National Guard Bureau. Each Director's position was later upgraded to a lieutenant general's assignment. The Army National Guard is also authorized a deputy director. Originally a brigadier general, the post was later upgraded to major general. Individuals who served as director or deputy director and subsequently served as NGB Chief include: Fleming; McGowan; Greenlief; Weber; Temple; Rees (acting); and Grass. The Director of the Army National Guard oversees a staff which aids in planning and day-to-day organization and management. In addition to a chief of staff, the Director's staff includes several special staff members, including a chaplain and protocol and awards specialists. It also includes a primary staff, which is organized as directorates, divisions, and branches. The directorates of the Army National Guard staff are arranged along the lines of a typical American military staff: G-1 for personnel; G-2 for intelligence; G-3 for plans, operations and training; G-4 for logistics; G-5 for strategic plans, policy and communications; G-6 for communications; and G-8 for budgets and financial management. Judd H. Lyons, Deputy Director, Army National Guard, 2013–2015. The Army National Guard fields 37 multifunctional support brigades. In 2016, the Army and the Army National Guard began a training and readiness initiative that aligned some Army brigades with National Guard division headquarters, and some National Guard brigades with Army division headquarters. Among others, this program included the National Guard's 86th Infantry Brigade Combat Team becoming affiliated with the Army's 10th Mountain Division and the National Guard's 1st Battalion, 143rd Infantry Regiment affiliating with the Army's 173rd Airborne Brigade Combat Team. In addition, 3rd Brigade Combat Team, 10th Mountain Division began an affiliation with the National Guard's 36th Infantry Division. 100th Infantry Battalion, 442nd Infantry Regiment, associated with 3rd Brigade Combat Team, 25th Infantry Division. 824th Quartermaster Company, associated with 82nd Sustainment Brigade. 3rd Brigade Combat Team, 10th Mountain Division, associated with 36th Infantry Division (TX ARNG). 5th Engineer Battalion, associated with 35th Engineer Brigade (MO ARNG). Myles Deering, State Adjutant General of Oklahoma, 2009–2014. ^ "Salem, Mass., declared National Guard's birthplace". Boston Globe. Boston, MA. Associated Press. 19 August 2010. Retrieved 14 May 2018. ^ Matthews, William (1 July 2017). "Busting The Caps". National Guard. Arlington, VA.
^ Mark Lardas (2011). George Washington. Bloomsbury Publishing. p. 14. ISBN 978-1-84908-881-7. ^ Aaron Bancroft (1855). The Life of George Washington ... Phillips, Sampson. p. 39. ^ Fawn McKay Brodie (1974). Thomas Jefferson: An Intimate History. W.W. Norton & Company. p. 112. ISBN 978-0-393-31752-7. ^ Ralph Louis Ketcham (1990). James Madison: A Biography. University of Virginia Press. p. 64. ISBN 978-0-8139-1265-3. ^ Michael Teitelbaum (2002). James Monroe. Capstone. p. 14. ISBN 978-0-7565-0253-9. ^ Carl Cavanagh Hodge; Cathal J. Nolan (2007). U.S. Presidents and Foreign Policy: From 1789 to the Present. ABC-CLIO. p. 45. ISBN 978-1-85109-790-6. ^ H. W. Brands (2006). Andrew Jackson: His Life and Times. Knopf Doubleday Publishing Group. p. 90. ISBN 978-0-307-27854-8. ^ Samuel Putnam Waldo (1819). Memoirs of Andrew Jackson: Major-general in the Army of the United States; and Commander in Chief of the Division of the South. J. & W. Russell. pp. 41–42. ^ Spencer Tucker; James R. Arnold; Roberta Wiener; Paul G. Pierpaoli; John C. Fredriksen (2012). The Encyclopedia of the War of 1812: A Political, Social, and Military History. ABC-CLIO. p. 331. ISBN 978-1-85109-956-6. ^ James Hall (1836). A Memoir of the Public Services of William Henry Harrison, of Ohio. Key & Biddle. p. 310. ^ Stuart L. Butler (2012). Defending the Old Dominion: Virginia and Its Militia in the War of 1812. University Press of America. p. 282. ISBN 978-0-7618-6040-2. ^ Louise A. Mayo (2006). President James K. Polk: The Dark Horse President. Nova Publishers. p. 14. ISBN 978-1-59454-718-8. ^ Soldiers. Department of the Army. 1980. p. 4. ^ Barbara Bennett Peterson (2002). Sarah Childress Polk, First Lady of Tennessee and Washington. Nova Publishers. p. 5. ISBN 978-1-59033-145-3. ^ John Seigenthaler (2004). James K. Polk: The American Presidents Series: The 11th President, 1845-1849. Henry Holt and Company. p. 34. ISBN 978-0-8050-6942-6. ^ Roger Sherman Skinner, ed. (1830). The New-York State Register for 1830–1831. p. 361. ^ Buffalo Historical Society; Buffalo Historical Society (Buffalo, N.Y.) (1907). Publications. The Society. p. xxxii. ^ John Farmer; G. Parker Lyon, eds. (1832). The New-Hampshire Annual Register, and United States Calendar. p. 53. ^ Ralph E. Eshelman (2011). A Travel Guide to the War of 1812 in the Chesapeake: Eighteen Tours in Maryland, Virginia, and the District of Columbia. JHU Press. p. 114. ISBN 978-0-8018-9837-2. ^ Philip Shriver Klein (1962). President James Buchanan, a biography. Pennsylvania State University Press. p. 18. ^ Illinois Adjutant General's Office (1882). Record of the Services of Illinois Soldiers in the Black Hawk War, 1831–32, and in the Mexican War, 1846-8. H. W. Rokker, state printer. pp. 100, 176, 183. ^ Hans L. Trefousse (1997). Andrew Johnson: A Biography. W. W. Norton, Incorporated. p. 14. ISBN 978-0-393-31742-8. ^ James Knox Polk (1989). Wayne Cutler; Herbert Weaver (eds.). Correspondence of James K. Polk. 7. Univ. of Tennessee Press. p. 439. ISBN 978-0-8265-1225-3. ^ Kate Havelin (2004). Andrew Johnson. Twenty-First Century Books. p. 21. ISBN 978-0-8225-1000-0. ^ Gary L. Donhardt (2007). In the Shadow of the Great Rebellion: The Life of Andrew Johnson, Seventeenth President of the United States (1808-1875). Nova Publishers. p. 6. ISBN 978-1-60021-086-0. ^ Clifton R. Hall (1916). Andrew Johnson: MIlitary Governor of Tennessee. p. 19. ^ James S. Brisbin (1868). The campaign lives of Ulysses S Grant and Schuyler Colfax. pp. 58–59. ^ Ulysses Simpson Grant (1969). The Papers of Ulysses S. Grant: April to September, 1861. SIU Press. p. 29. ISBN 978-0-8093-0366-3. ^ William Farina (2007). Ulysses S. Grant, 1861–1864: His Rise from Obscurity to Military Greatness. McFarland. p. 22. ISBN 978-0-7864-8051-7. ^ William Dean Howells; Rutherford Birchard Hayes (1876). Sketch of the life and character of Rutherford B. Hayes. Also a biographical sketch of William A. Wheeler. p. 29. ^ John Clark Ridpath (1881). The Life and Work of James A. Garfield ...: Embracing an Account of the Scenes and Incidents of His Boyhood. Jones brothers. pp. 91–92. ^ James T. Wall (2008). Wall Street and the Fruited Plain: Money, Expansion, and Politics in the Gilded Age. University Press of America. p. 82. ISBN 978-0-7618-4124-1. ^ Emma Rogers (1921). Chester A. Arthur: Man and President. University of Wisconsin—Madison. pp. 7–9. ^ Lew Wallace; Murat Halstead (1892). Life and Public Services of Hon. Benjamin Harrison, President of the U.S.: With a Concise Biographical Sketch of Hon. Whitelaw Reid. Edgewood Publishing Company. pp. 178–181. ^ Eric Foner (2002). Reconstruction: America's Unfinished Revolution, 1863–1877. HarperCollins. p. 584. ISBN 978-0-06-093716-4. ^ John W. Tyler (1901). The Life of William McKinley. P. W. Ziegler & Company. p. 37. ^ Kevin Phillips (2003). William McKinley: The American Presidents Series: The 25th President, 1897–1901. Henry Holt and Company. p. 23. ISBN 978-0-8050-6953-2. ^ William Montgomery Clemens (1914). The Ancestry of Theodore Roosevelt. W.M. Clemens. p. 11. ^ Gabriele Arnold (2006). Harry S. Truman – his foreign policy. GRIN Verlag. p. 4. ISBN 978-3-638-51025-7. ^ Michael J. Devine (2009). Harry S. Truman, the State of Israel, and the Quest for Peace in the Middle East. Truman State Univ Press. p. 93. ISBN 978-1-935503-80-4. ^ Truman, Harry S. (1983). Ferrell, Robert H. (ed.). Dear Bess: The Letters From Harry to Bess Truman, 1910-1959. Norton. p. 306. ISBN 978-0-8262-1203-0. OCLC 9440945. ^ Clarke Rountree (2011). George W. Bush: A Biography. ABC-CLIO. pp. xviii–xix. ISBN 978-0-313-38500-1. ^ "Biography, Major General Judd H. Lyons". National Guard Bureau General Officer Management Office. National Guard Bureau. Retrieved 24 June 2015. ^ "Awards and Citations, Walter E. Fountain". Hall of Valor. Military Times. Retrieved 16 February 2016. ^ "Awards and Citations, Timothy J. Wojtecki". Hall of Valor. Military Times. Retrieved 17 February 2016. ^ "Biography, Timothy M. McKeithen". General Officer Management Office. National Guard Bureau. 1 October 2015. ^ General Officer Management Office (2018). "Biography, Charles W. Whitington Jr". NationalGuard.mil. Arlington, VA: National Guard Bureau. Retrieved 3 February 2019. ^ Dwyer, Brian (17 October 2016). "Patching Ceremony Unites 10th Mountain Division and Vermont Army National Guard Unit". TCW News. Watertown, NY. ^ Tan, Michelle (19 August 2016). "Army units change patches as part of active, Guard and Reserve pilot program". Army Times. Springfield, VA.
^ Block, Gordon (20 October 2016). "Programs link Fort Drum soldiers with Army Guard, Reserve personnel". Watertown Daily Times. Watertown, NY. ^ Tuscaloosa News, 31st Dixie Division Turning to Armor, 19 January 1968. Wikimedia Commons has media related to United States Army National Guard.